Sneaker Trend; Hot or Not?! This post is sponsored by Nike. However, all thoughts and opinions are 100% my own. Where are my sneaker lovers, this one is for you!! The All new Nike Air Max 720 is here, and it’s the sneakers of all sneakers. But first, let’s talk a little bit more about one of my favorite trends this season; the sneaker trend. 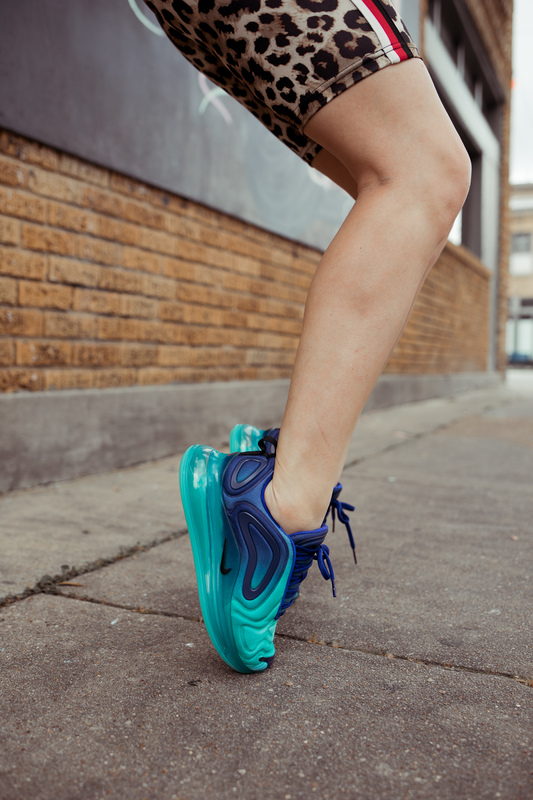 Sneakers are no longer worn just at the gym, or for working out. You now see sneakers being worn with dresses, skirts, and even suits. And if you ask me, it all. looks. good. *insert hand clap here*. Sneakers are now officially considered a fashion statement! The best part about the sneaker trend is- it’s comfortable! If you’re not into heels, then this trend is perfect for you! I’m loving the new Air Max 720, it’s Nike’s tallest Air bag yet, offering more Air underfoot for incredible all-day comfort- and I mean all day long! I wore these all day, and my feet felt amazing! I wanted to pair these trendy sneakers in a very different way, I didn’t want to pair them with a pair of denim jeans or even a skirt. These Air Max 720 deserved something much cooler. What better way to pair them with another trend I am digging at the moment-biker shorts! You can now call me a cool mom, or does that make me uncool for asking you to call me that, LOL! Because the shoes and the biker shorts are already loud, I went with a white tee (I sized up for an oversized fit) and threw on a denim jacket to complete the look! Overall, I am SO proud of this look and officially my favorite look for 2019! What do you think of this look?! Comment below! Love these pics Elly!! Also a denim jacket will literally tie any outfit together. You’re definitely a cool mom. I love this! These pieces are beautiful <3 You are looking so pretty. I am your fan, after watching those cool pictures. I love these type of shoes. Is it comfortable for a morning walk and jogging? Yes for walking! I walked around with my kids during the day and my feet felt great! Woow. Lovely shoe color you got there. Would want one of those for me and my kid.